Psychologist Dr. Daniel Rinaldi consults with the Pittsburgh Police. His specialty is treating victims of violent crime—those who’ve survived an armed robbery, kidnapping, or sexual assault, but whose traumatic experience still haunts them. 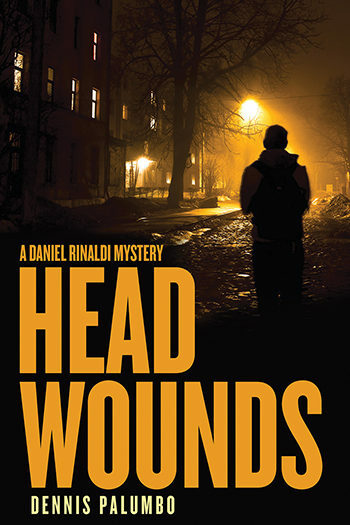 Head Wounds picks up where Rinaldi’s investigation in Phantom Limb left off, turning the tables on him as he, himself, becomes the target of a vicious killer. “Miles Davis saved my life.” With these words Rinaldi becomes a participant in a domestic drama that blows up right outside his front door, saved from a bullet to the brain by pure chance. In the chaos that follows, Rinaldi learns his bad-girl, wealthy neighbor has told her hair-triggered boyfriend Rinaldi is her lover. As things heat up, Rinaldi becomes a murder suspect. But this is just the first act in this chilling, edge-of-your-seat thriller. As one savagery follows another, Rinaldi is forced to relive a terrible night that haunts him still. And to realize that now he—and those he loves—are being victimized by a brilliant killer still in the grip of delusion. Determined to destroy Rinaldi by systematically targeting those close to him—his patients, colleagues, and friends—computer genius Sebastian Maddox strives to cause as much psychological pain as possible, before finally orchestrating a bold, macabre death for his quarry. How ironic. As Pittsburgh morphs from a blue-collar town to a tech giant, a psychopath deploys technology in a murderous way. Enter two other figures from Rinaldi’s past: retired FBI profiler Lyle Barnes, once a patient who Rinaldi treated for night terrors; and Special Agent Gloria Reese, with whom he falls into a surprising, erotically charged affair. Warned by Maddox not to engage the authorities or else random innocents throughout the city will die, Rinaldi and these two unlikely allies engage in a terrifying cat-and-mouse game with an elusive killer who’ll stop at nothing in pursuit of what he imagines is revenge. A true page-turner, Head Wounds is the electrifying fifth in a critically acclaimed series of thrillers by Dennis Palumbo. Formerly a Hollywood screenwriter, Dennis Palumbo is now a licensed psychotherapist in private practice.